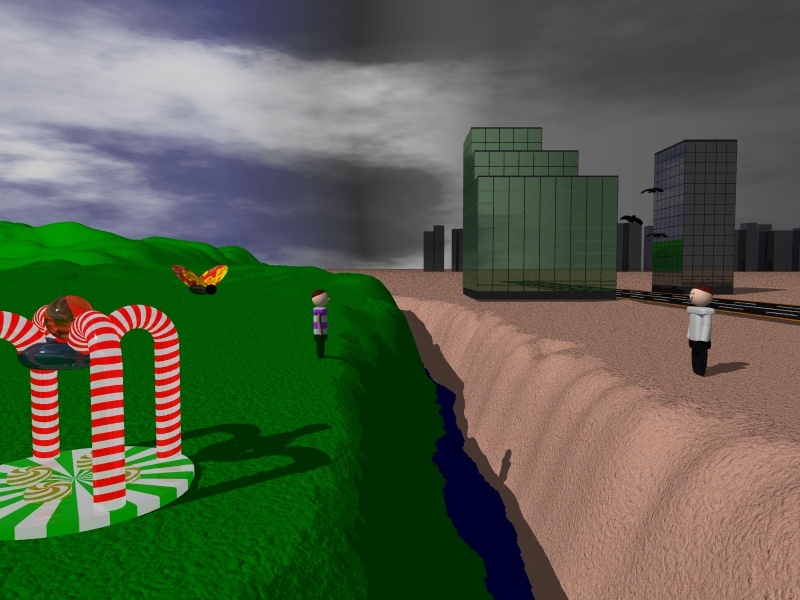 This image was entered in the November/December 1997 Internet Ray-Tracing Competition for the theme of Childhood. Be sure to notice the link to "View previous rounds" on the IRTC page, or you may miss the hundreds of incredible submissions that reside there! The idea behind this image was to show two worlds: that of the child, and that of the adult, in the same image. The world of the child is shown as colorful, smooth, and simple, while the adult world is shown as dark, angular, and featureless. Separated by an impassible rift, we find the occupants of either side standing at the brink, looking forward (or back) to the other side.